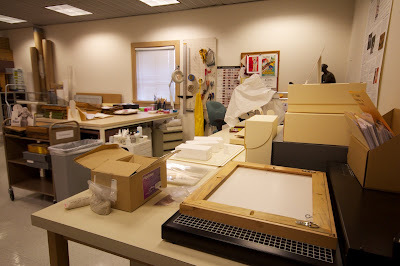 The Margaret Herrick has a full time conservator on staff. Swoon. Here is the well appointed preservation workshop. While actual professional book preservation is a tantalising but unlikely possibility for smaller institutions, there is nothing quite like a day locked in a room with pots of glue and boxes of book binding/repair equipment to bring a library team together. Add to this equation chocolate, caffeine, gossip (professional and other) and secret shame music-show-and-tell and you get a picture of repair day with the National Art School Library team back in Sydney.